When you need in-depth information from the leading experts in fall protection and safety, look no further than our Technical Safety Handbooks. Each book is designed to apply to any brand of equipment, and contains detailed explanations for readers of all levels. With thousands of copies in use by individuals, public and private sector technicians and emergency services teams across the world, they are the accepted reference texts in their subject matter. This essential reference is the first complete guide to inspecting all forms of industrial and sporting PFPE, covering the legal and record-keeping requirements for UK workplaces, plus the practical process of inspection and maintenance, in complete detail and an easy-to-read style. Nobody using a harness can afford to be without it. 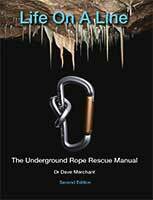 The definitive textbook on underground rope rescue from caves and mines, written for rescue teams, group leaders and individuals. Also in use throughout the world by the military, scientific exploration projects and extreme adventure companies as the gold standard for safe and effective management of vertical rescue.